LBC radio has announced on Twitter that controversial presenter Katie Hopkins is to leave the station “effective immediately”. 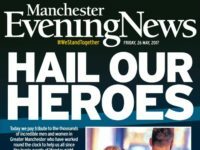 Hopkins, who has a regular column on Mail Online, has sparked outrage over her comments following Monday’s Manchester bombing atrocity in which 22 people were killed and dozens injured, including children. 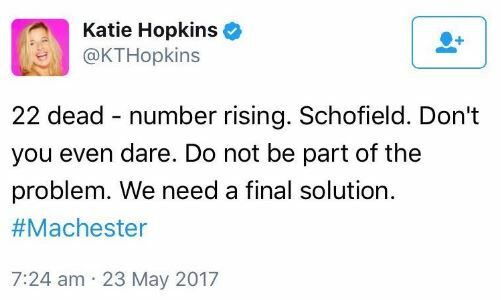 She later deleted the reference to the “final solution”, which echoed the Nazi term for the holocaust, changing it to “true solution” after public outcry. “Schofield” is thought to be a reference to ITV’s This Morning presenter Philip Schofield who walked across Westminster Bridge in a move of defiance following the terror attack outside Parliament in March. 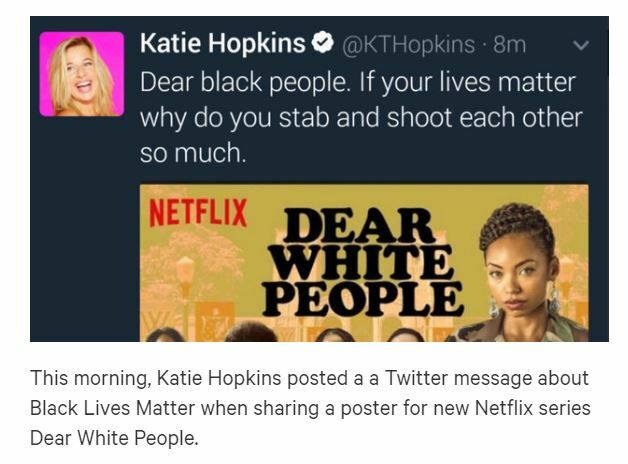 A later tweet by Hopkins was reported to the Metropolitan Police who confirmed they had received a “complaint” and that it would be “reviewed and assessed by specialist officers”. Hopkins, who rose to fame as a contestant on BBC show The Apprentice, has 736,000 followers on Twitter, a platform on which she regularly posts comments. She recently lost a libel case against food writer Jack Munroe, after confusing her for someone else on Twitter, and was ordered to pay £24,000 damages. LBC is owned by Global, the UK’s largest commercial radio company, whose portfolio includes Capital FM, Heart, Classic FM and Radio X. 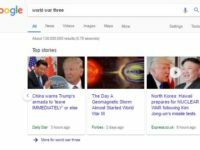 Other presenters on the station include former UKIP leader Nigel Farage and journalists Nick Ferrari, James O’Brien and Stig Abell. 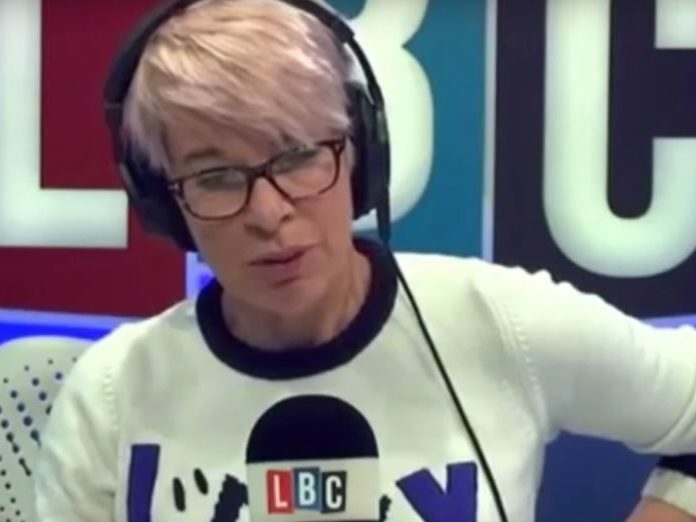 More than 2,000 signed a petition on the website Left Foot Forward calling for advertisers to boycott the radio station until Hopkins was sacked. 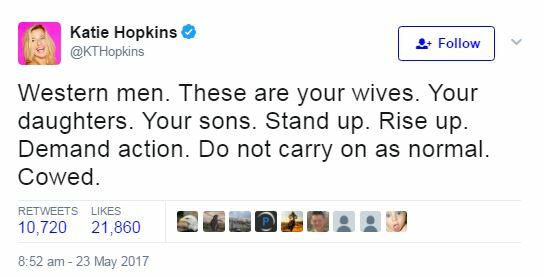 Some 45,000 people have signed a Change.org petition calling for Hopkins to be sacked over another controversial Twitter message which she sent earlier this year, and then deleted. LBC may not be overtly denying her the right to free speech, but it is implying her LBC employment is conditional on restricted/compromised opinions even in a personal capacity – which amounts to much the same.